The first rule about extended spring training is you don’t talk about extended spring training. Just kidding, but it’s not like people talk about it, anyway. You have to do some persistent digging to come across a Minor League Spring Training or Fall Instructional League schedule; but I have yet to come across an extended spring training schedule. Game times are subject to change, which I found out first hand on Saturday. It’s lucky that I insist on getting to the fields around 9 am despite the fact that I know that all the players do is stretch and throw for what seems like an hour. This stubbornness saved me from being insufferably late, and I arrived at the Twins complex with enough time to be treated to my fix of stretching and throwing. Extended Spring Training is essentially the same as regular spring training, except there are far fewer players. The players who populate the lineups are likely ticketed for Short-Season Lowell, the Gulf Coast League, or the Dominican Summer League. The most interesting name in this lineup is Mark Wagner. 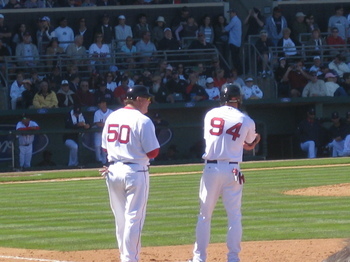 Wagner, a ninth round pick in the 2005 draft and former top-catching prospect in the Red Sox Organization has spent the last few weeks in extended spring training. The catch: he’s healthy. Wagner was on the 40-man roster, but was designated for assignment to make room for Michael McKenry, whom the Red Sox got in the Daniel Turpen trade. (Turpen was selected by the Yankees in the Rule 5 Draft. He did not remain on the 40-man roster, so he was returned to the Red Sox, and they traded him to the Rockies organization). I spoke to Wagner briefly after the game. He is very polite, and he had a good attitude about everything. He said that he was just playing games, but I got the vibe that he didn’t really know what his status was with the organization. There is really no room for him at this point in the organization. Christian Vazquez and Carson Blair are in Greenville; Dan Butler is the primary catcher in Salem; Ryan Lavarnway and Tim Federowicz are splitting time behind the plate and as the designated hitter in Portland; and Exposito and McKenry are splitting time in Pawtucket. If anything, I think Wagner is a guy that some of the younger catchers can talk to. I picked a great day to go because I was able to see Jennel Hudson take the mound for the first time in two years. He has been plagued with arm injuries for the past two seasons, and has been recovering from Tommy John surgery. His father, Frank, was at the game, and I found out that Jennel has taken a rather unique path. He didn’t actually play baseball in high school or college. He played little league, but not at a young age. He only threw one inning because it was his first time facing live batters in over two years. He faced four batters in the first inning; though the first batter would have been out had the defense made the play. He threw 14 pitches, nine of which were for strikes. He hit his second batter, but it seemed like his concentration was broken because of the runner. Obviously, I’m not too concerned with his command or anything like that because it’s his first start in two years. The only reason I included his strikes/pitches ratio was because it was so impressive. I just wanted to see him throw; but the fact that he was throwing a lot of strikes was encouraging. Jason Garcia piggy-backed Hudson, and he threw at least five innings (I don’t have the exact number because I was walking back and forth between the fields). It seemed like he was leaving the ball up in the zone a bit because hitters were tagging the ball when they hit it. Garcia was kind enough to speak with me after the game, and the interview will be up on the SoxProspects website within the coming weeks. I knew this before, but talking to him extensively confirmed my thoughts on him. At this point, I couldn’t care less if he gives up one run or 14. He was a guy that dominated in high school: he could miss his spot and hitters couldn’t catch up to it. But Garcia is adjusting to a completely new level; he is more evenly matched. Hitters will take advantage of his mistakes now, and he has to learn how to adjust, which he will. He has already added some velocity to his fastball, and he is very coach-able. Xander Bogaerts is going to emerge onto a lot of people’s radars this year. He plays shortstop, and he is absolutely fantastic defensively. In the Dominican Summer League last year, he hit .314 with an on base percentage of .386. One thing I was a bit skeptical of was his swing. It seemed like he wasn’t following through, and that he was almost stopping short. Garin Cecchini seems like he has really good mechanics, and he has a solid swing. He waits for his pitches, but he isn’t afraid to be aggressive. In his first at-bat, he launched a stand-up triple, which was nearly an inside the park home run. In his second at-bat, he hit a deep fly ball, which was caught, on the first pitch he saw. I feel like his mechanics are good enough for Greenville, but I don’t blame the Red Sox for taking it slowly with him considering he didn’t see pitches for a year after tearing he ACL. I think he is really going to impress a lot of people in Lowell this year. Trygg Danforth, a 49th round pick, possesses a lot of power potential, but the mechanics aren’t fully there yet. He has a really big swing, and he doesn’t keep his hands in. Nevertheless, he connected for a home run. I noticed a similar issue with Beau Bishop, who was signed as a catcher out of New Zealand. Interestingly enough, he was playing third base. I wonder if the Red Sox are considering switching him to an infielder. Speaking of Oceania, I had the pleasure of meeting Brad Tippett, an Australian native and a pitcher in the Twins organization who is currently rehabbing. He had a nerve problem in his arm, and he ended up having to get a rib removed. He had pitched well in the minor leagues so far–compiling a 3.04 ERA over the last five seasons–and is now hoping for a spot to open in the Fort Myers Miracle, the High-A affiliate of the Twins. One more thing in general that I noticed. At this level, outfielders don’t know how to read trajectories yet, so they have really odd approaches to fly balls. At the upper levels, outfielders have to be able to read and adjust to the spin on the ball, but these guys are still developing that skill. Workouts start later and end earlier, it seems. They hardly start doing PFPs and infield drills until 10 (the players stretch and throw forever). Players are mainly split up by level, but some players are bumped up to the next level. For example, Hassan has been working out in Pawtucket because guys like Juan Carlos Linares have been up with the big league club. Some guys bat or pitch in lower levels just to get at-bats or innings in. I talked to Chris Hernandez in the morning. He had pitched for Salem on Thursday. He doesn’t describe himself as a power pitcher. His off-speed stuff is phenomenal, though. Brock Huntzinger threw for Double-A Portland on Thursday. He said he was topping out between 88-92 mph, and that he felt pretty good for his first outing. Madison Younginer is now listed among the rehabbing players. Not much information on that yet. Chris Mellen and I went up to Port Charlotte to watch the Single-A teams. Lowell wasn’t playing today. Brandon Workman threw for Salem. He displayed all of his pitches: two and four seam fastball, cutter, change up, and curveball. He was topping out at least in the low 90’s (via Mellen’s radar gun). Workman didn’t seem too pleased with his outing. He did struggle with his control, but this is completely normal this early in games. Chris Balcom-Miller piggy-backed him, but I was watching the Greenville game at this point. Apparently, he was topping out around 88 mph. Stroup started, followed by Couch, Gleason, Huijer, and Erasmus. Couch said he felt pretty good. Huijer’s off speed stuff looked good today. I was walking back-and-forth a lot, but apparently Coyle and Cecchini both got singles, and De La Cruz hit a double. Miles Head hit a long fly ball, and then hit a single down the right field line. Coyle has a lot of speed. Brandon Jacobs left the game after splitting his lip open in a collision at home plate. He should be OK, but he might take it easy tomorrow. Tomorrow, Anthony Ranaudo will pitch for High-A Salem. It is likely that Alex Wilson will pitch for Double-A Portland since he charted today. Ryan Lavarnway hit an absolute bomb into left field off of James Shields (this comes from Chris Hatfield, Jon Singer, Jon Meoli, and Mike Andrews, who all watched the Triple and Double-A games at the complex today). Finally, on a more personal note, I got into Syracuse’s New House School of Communications. I’m pretty sure I will be going there next fall. Today, the Red Sox minor league affiliates played the Twins’ minor league affiliates. Double-A and Triple-A were home, and all the Single-A teams were close by at the Lee County Sports Complex. I decided to make the quick drive over because I wanted to watch Chris Hernandez throw his two innings for Salem. Kyle Weiland threw on Wednesday. He said that it went well and that he felt good. Will Middlebrooks, who will likely make the transition to Double-A Portland, has been working out with Triple-A Pawtucket. Kolbrin Vitek and Michael Almanzar impressed coaches with their defensive skills at third base. Lucas LeBlanc (playing for Salem) got some good wood on the ball and induced two relatively deep fly balls. Catcher Christian Vazquez got fooled on an 86 mph changeup, but tripled to right on the next pitch. He has a strong arm, but needs to work on his accuracy; his throws to second are high. First round pick Kolbrin Vitek crushed a ball to straightaway center for a triple. Chris Hernandez piggy-backed Ryan Pressly. In his first inning, he retired the side in order. He started each count with a ball, but followed with a strike. He only gave up a double in his second inning. His off speed stuff looks nasty: it has great movement and drop. He looks fairly advanced. Hunter Cervenka started for Greenville. He threw only eight pitches to four batters his first inning, but threw 28 pitches to six batters his second inning (though there were two errors). Miles Head hit a double into right-center. Twins minor league pitcher David Bromberg was watching the High-A teams. He was the Twins’ minor league pitcher of the year in 2009, where he posted a 2.70 ERA for the Twins’ High-A club. In 2010, he split time between Double and Triple-A, posting a 3.75 ERA. Sox Prospects correspondent Jonathan Singer reports that Will Middlebrooks was taken out of the Pawtucket lineup in the third inning with an undisclosed injury; though it doesn’t appear to be serious. They will probably take it day-to-day. Oscar Tejeda crushed a home run (via Chris Mellen). Ryan Lavarnway threw a runner out at second. In case you missed it this morning, the Red Sox made some more inevitable cuts. The semantic differences between “optioned to” and “reassigned to” will always elude me. Jose Iglesias, Luis Exposito, Yamaico Navarro, Lars Anderson, and Juan Carlos Linares were among those sent back to minor league camp. Brandon Workman will pitch for Salem tomorrow. Stolmy Pimentel will pitch for Portland. perspectives depending on where they are in their development. no idea whether or not these guys know that I’m not exactly official. But what I do know is that they have never made me feel unofficial. Dogs…” but even if I don’t, they never ask whom I’m affiliated with. to sit down with me. he had to take extra batting practice, but asked if I was in a rush. while I finished up interviews with Gibson and Matt Price, respectively. bad about waiting. 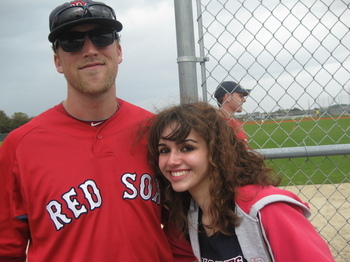 In fact, Middlebrooks mentioned that I had been waiting. Waiting is an inevitable part of what I do, but waiting is by no means something the players have to do. right in the parking lot. the fact that I also have senioritis). Here are some of the most interesting things I have learned so far from talking to these guys. ball will get away from them, and with righties it will fade into them. and they can repeat their mechanics. of trying to eliminate it completely. arsenal, or even learning how to handle living on your own. -The importance of repeating and mastering mechanics and fundamentals. to realize that and give what you can to avoid injuries. Yastrzemski work with the minor league guys on hitting mechanics. checking out the great foundation of young players that he has built up. I’m thinking of making a flikr account so all the pictures can be seen because I take a lot. I’ll post it here if I make one. If you want players or updates on specific minor league players, let me know. There’s good news and there’s bad news. The good news is obviously that spring training–in its most basic form–is here. The bad news is that UNC Chapel Hill was not my pitch either. Another strike, but I am neither out nor in the hole: for I have been accepted into both Marquette and the University of Maryland. I have not been lucky when it comes to the crapshoot that we call the college admissions process, but hard as it has been, I have done my best to keep some degree of faith. As J.R.R. Tolkien says, “Faithless is he that says farewell when the road darkens.” My road has darkened considerably, but I’m hoping that I’ll end up in the right place. Having two strikes is certainly a precarious and uncomfortable position to be in, but it ain’t over ’til it’s over. Tolkien also says, “All we have to decide is what to do with the time that is given to us.” No matter where I end up going to school, I figure as long as I take advantage of my resources and spend my time wisely, I will still achieve my goals. Baseball is a bizarre game, and college admissions is a bizarre process. You can look at and measure statistics, but you can never truly predict the end. You can’t try to figure out what the next pitch is going to be. Baseball players have to adapt. Sometimes a pitcher’s curveball isn’t working, so they have to make an adjustment. Similarly, I’m adapting to what is being thrown at me. Let’s focus on the good news, though: baseball officially returns today. Baseball fans are crazy because not only do we get excited over games that don’t even count, but we also get excited over workouts. For the rest of February, we will get excited over essential, but otherwise monotonous fundamental drills, batting practice, and bullpen sessions. Spring Training has been a sort of coming-of-age process for me. My intentions seem to change ever year. 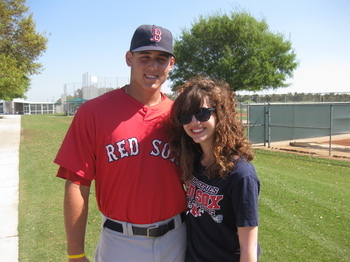 I’m pretty sure my first spring training game ever was a Red Sox vs Marlins game at Roger Dean Stadium in 2005. I had not yet developed a passion for minor league baseball, so I was only looking forward to seeing the big-league stars. That being said, I was really disappointed when, after a two hour rain delay, I had no idea who was in the lineup. Then spring training became more about getting autographs. I would always get to games early to watch batting practice, but then I started to realize that I could spend that time getting autographs. And then I became more interested in the minor league players than the regulars. And I think that this interest actually stemmed from my pursuit of autographs. Once you begin to collect autographs, you realize that it’s an art–especially during spring training when the jersey numbers are between the 50s-90s, and there are new ones everyday. It was always necessary to have a roster at hand to match the number with the name. The guys that were the best about signing were the non-roster invitees. Spring training for them is obviously quite a different experience than it is for the regulars: it is their chance to make an impression. Not only do they go above and beyond on the field, but also off the field. I really appreciated as small of a gesture as a signature, and it made me want to know more. I got especially excited when they came up to bat because they had signed my ball. The non-roster invitees may not have secured a spot on the 25-man roster, but they had certainly succeeded in making a lasting impression. I wanted to continue to follow them in the minor leagues, so I started my project program. Essentially, if a player impressed me during the spring, he became my project: a guy whom I thought could have an impact on the club come September or injury. And what if I had the opportunity to talk to one of my projects? 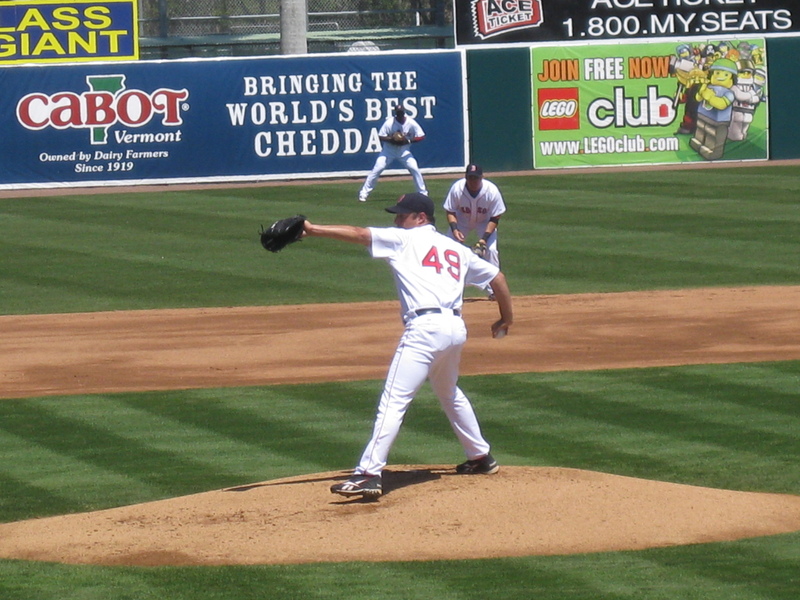 I never anticipated that opportunity, but in the summer of 2009, when I was in Pawtucket, I spent an entire baseball game talking to my favorite pitching project, Michael Bowden. That conversation literally changed my life. If Bowden had not been so friendly and willing to talk to me, I don’t think I would have the confidence that I have today in approaching other players. I learned more about the game in those three hours with him than I had learned in a whole lifetime of watching the game. He literally changed the way I watched the game. Again, what may have seemed like a small gesture to him changed everything for me. I became even more enthralled with minor league baseball than I already was. I took more interest in the draft, and especially the lower levels of baseball. Last year during spring training, I decided to go to the minor league complex instead of going to watch the regulars take batting practice before the game. I realized that I had been missing something. Sure, these games are even less relevant than the major league ones are, but there was still something that absolutely enthralled me. I would not have left had I not had tickets for the major league game. The ability to simply walk and talk with players after their workouts was thrilling for me because I could ask whatever I wanted. So that experience not only inspired me to seek opportunities with the Pawtucket Red Sox and Portland Sea Dogs this past summer, but also inspired me to approach spring training from a completely different angle this year. This year, I have decided that I do not want to go to any major league spring training games at City of Palms Park. I am resolved to attend exclusively minor league spring training games at the player’s development complex. I plan on making my first pilgramage tomorrow: for the first official workouts for pitchers and catchers that is open to the public. I want to share with you a few of the minor league prospects I plan on focusing on this spring that will not be in big league camp: Alex Hassan, Anthony Ranaudo, Brandon Workman, Bryce Brentz, Chris Hernandez, David Renfroe, Derrik Gibson, Drake Britton, Felix Sanchez, Garin Cecchini, Jason Garcia, Kolbrin Vitek, Jeremy Hazelbaker, Lucas Leblanc, Madison Younginer, Pete Hissey, Ryan Westmoreland, Sean Coyle, Swen Huijer, and Will Middlebrooks. Of course, I can’t forget about the guys who are lucky enough to be in major league camp. I know they will be working hard to leave an impression. From the 40-man roster, I suggest you keep an eye out for Michael Bowden, Felix Doubront, Stolmy Pimentel, Luis Exposito, Lars Anderson, Jose Iglesias, Yamaico Navarro, Oscar Tejeda, Ryan Kalish, Darnell McDonald, Daniel Nava, and Josh Reddick. From the non-roster invitees, I suggest keeping an eye on all of them. The ones I am already familiar with are Andrew Miller, Jason Rice, Kyle Weiland, Alex Wilson, Tim Federowicz, Ryan Lavarnway, Nate Spears, and Che-Hsuan Lin. Anthony Ranaudo is a guy whom I am really excited about because his 2009 campaign at LSU was incredible. He is a guy that is getting a lot of hype right now, but I don’t think that we should set our expectations too high simply because this will be his first year in professional ball. Same mentality applies for Brandon Jacobs. Drake Britton is certainly a name to start getting familiar with. He had a fantastic campaign in Greenville last year (Single-A affiliate). Again, we should not set the bar too high because he will be advancing to another level. It is possible that he could go straight to Portland, but I would like to see him dominate Salem for at least a bit because after speaking with Kyle Weiland this past summer, it seems very hard for a pitcher to skip levels. this season. Drake Britton won the Sox Prospects Breakout Player of the Year Award last year, and I predict that either Younginer or Ranaudo will win it this year. Garin Cecchini, Sean Coyle, and Will Middlebrooks are the infielders that I look forward the most to covering this spring. I think that this will be Kyle Weiland’s season to break onto everyone’s radar. When I was in Portland, not only did I get to interview him, but I also got to cover one of his starts, and it was one of the best pitching performances I have ever seen. I’d like to see him dominate in Portland a little bit more, get promoted to Pawtucket, do some work there, and then I hope to see him up in September. This spring, I plan on taking Tolkein’s advice. “All we have to decide is what to do with the time that is given to us.” I have decided to spend my time pursuing minor league spring training, and I hope that this will be my best spring training yet. And I hope especially that those of you that read this blog can live vicariously through my experiences. If you have any specific requests for what you would like me to cover during the spring–whether it be particular questions for particular players–please let me know by either leaving a comment below or e-mailing me. And for real time updates while I’m at the complex with quotes, pictures, and more, please follow me on Twitter.